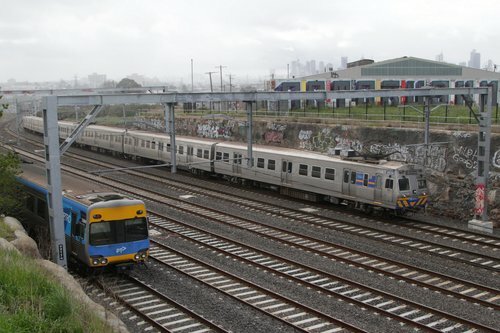 This week the Herald Sun ran a piece titled “Suburban sky rail: Spin vs reality”, featuring ugly examples of elevated rail in Melbourne, covered in graffiti and littered with rubbish. For the purposes of comparison, here are some equally unattractive examples of railway lines being sunk beneath the road. We start at Footscray, where the tracks at both ends of the station run in a ‘slot’ beneath the road. 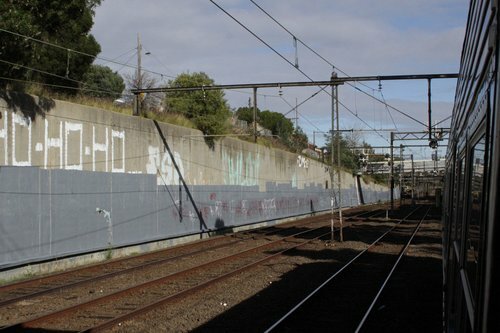 The cutting at the city end was recently expanded to six tracks as part of the Regional Rail Link project, but the graffiti vandals have already left their mark. Even a steam train chugging past doesn’t make the cutting look any nicer. 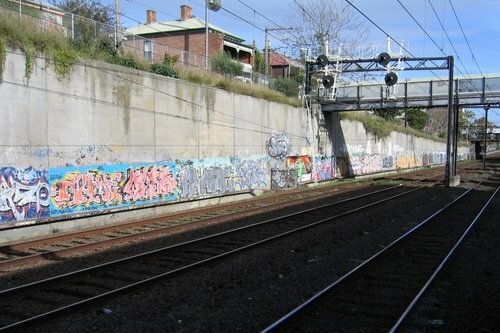 Windsor is another railway station located below ground – with a brick walled cutting runs between Chapel Street and Dandenong Road, covered with graffiti. 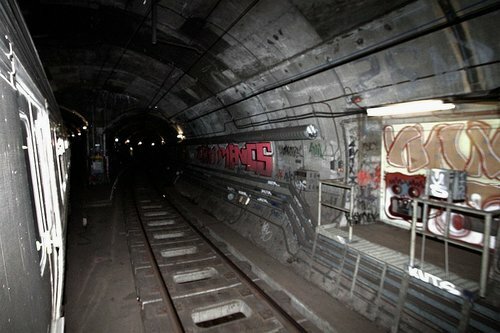 The tracks between East Richmond and Burnley are located in a concrete walled cutting beneath the streets of Richmond, where graffiti features heavily. Even when the graffiti finally gets painted over, it reappears soon after. Nearby at South Yarra, the railway towards Caulfield passes beneath Chapel Street next door to the Jam Factory and again, graffiti and litter features. At Camberwell the tracks were lowered beneath Burke Road almost a century ago, but the brick walls that line the cutting are still a magnet for graffiti vandals. The concrete walls on the other side are just as unsightly. And don’t think putting railway tracks underground is a way to stop graffiti – even the City Loop tunnels are full of painted scrawl. A graffiti covered railway viaduct gives passengers a clear view across suburbia, with the ugly side facing local residents and road users; while a graffiti covered railway cutting hides the urban blight at the bottom of a hole, where only train passengers will see it. Sounds like the Herald Sun is pandering to their key demographic of road users and NIMBYs, and doesn’t give a stuff about people who actually use public transport? the Premier’s vision of a “beautiful” parkland oasis beneath the proposed Cranbourne-Pakenham sky rail is under a cloud as it emerged that existing elevated lines are neglected and vandalised. Premier Daniel Andrews has promised “community open spaces, parks, playgrounds and netball courts” beneath the controversial tracks, being built to remove nine level crossings. But a Herald Sun analysis has exposed a reality of concrete pillars and elevated track beds covered in ugly graffiti tags. West Richmond, Clifton Hill, Hawthorn, Oakleigh, Gardenvale, Elsternwick and Balaclava overpasses have all fallen victim to vandals and open spaces have become desolate litter-strewn wastelands avoided by residents and traders. I suppose the residents having been forced to pay a million for their patch of suburbia, up against the railway line, demand a million dollar view to go with it.Sadly for them that includes the railway line which has to multiply sooner rather than later.Take the money and run. Not much different to suburban residents who have apartment blocks built next door then take the developer to VCAT – but only Skyrail objectors get the option to make the development a political issue. I am still undecided what I think about the proposal for a viaduct, although I do think a tunnel might be better. That said, your post showing ugly trenches makes a very good point in response to the Herald-Sun article. I ride the Hurstbridge line these days and I now appreciate just how little graffiti there is along my line in comparison to others. I used to travel along Belgrave-Lilydale and remember that ugly cut-out near Burnley. It reminds me too that there’s a good example of a viaduct between Auburn and Glenferrie. That one works well. Auburn and Glenferrie is mostly embankments, with small bridges over the local roads – a similar design to the West Richmond – Victoria Park section of elevated track through Collingwood. Interesting you should choose the Regional Rail Link work as an example. In that case also local residents were “consulted”. Consultation consists of suddenly appearing with the proposal one day before it is announced. Residents are then “asked” for their opinion. They are told what will happen to them and then they get to respond. But whatever they think they can’t actually change the proposal. This is why people really hate these bastards. This might or might not be a good idea (although I suspect this is more about funneling money into the pockets of mates than anything else) but pretending that locals are being consulted is rubbish. If there is a good case for the change – what is the government frightened of – why not take the time to persuade the local residents of that change. Note: The disaster that is the regional rail link – is now implicated in the damage to train wheels currently costing taxpayers millions and stopping trains on the Gippsland line. Apparently the result of cost cutting on the regional rail track. Then the government turns around and says the industrial area on the other side of the tracks would be acquired instead. An even better example of a sh* ugly cutting is the recent work at Blackburn. Here’s Rook’s Road looking east. For added impact, use the time slider to go back to 2008. And this is a recent example – it’s a better reflection of what a cutting through Carnegie etc would look like. Before the graffiti was added. One problem with trenches that has probably not been mentioned is the likelihood of the adjoining path developing cracks possibly due to the drying-out of the ground or other ground movement. The South Morang extension has a few very bad cracks along it. @Cat – Agree that the “consultation” process is a bit of a misnomer, but elevated rail is the only way to make the project work (tunnels too expensive, cuttings too wide because of walls, disallows four tracks to separate slow/stopping and fast/express), so the result was inevitable. I’m not sure if there really is a better way to handle that, other than engaging a marketing firm in an education campaign. As for graffiti risk, that can largely be solved by abolishing all flat “canvas” surface areas. Bolt on some textured steel plate, or design the columns with protruding light fixtures etc, along the line of the underpass at Cardinia Road station. Well, the original plan was neither a tunnel or a sky rail, but simple grade separations exactly as is under construction between Bentleigh & Ormond. That’s already nicer than an at-grade crossing. Well-written piece, Marcus. I do agree with you final paras. Coming from Sydney, I am following this with some interest, as we’ve had the same stuff play out here. We had the Chatswood-Epping Line undergrounded at great expense, and with problematic grades as a result, resulting in one station being canned, and problems with some rolling stock. We’ve also had the ongoing issue of the Cahill Expressway and Circular Quay station, which I love. People forget that they live in cities, and that accepting the vibrancy and employment opportunities of that means accepting some infrastructure (and infrastructure can actually be quite pretty – even a brutalist overpass signals dynamicism and commerce). Want complete quiet and pristine views? Move to Outer Scumsville Siding West, but accept the unemployment, and the lack of cultural activities. A handful of homeowners shouldn’t dictate that thousands of commuters are denied a pretty run into town with a view, consigning them to concrete trenches or tunnels. In Sydney, you can be broke and living fifty kilometres from the CBD, but can still get those few moments of “two bob millionaire” when you come into Circular Quay Station. This is as it should be, and despite the efforts of developers and people like Keating to stuff it up. Melbourne needs to build that elevated line. The entire corridor from Richmond to Caulfield (and from there to Oakleigh) is a graffiti covered eyesore with the bit to Hawksburn getting the odd paint job to cover it these days – this is the bit of Melbourne many see daily and tourists see and makes a mockery of the list of Melbourne eyesores that come up from time to time. One thing the planners did right in the 1950s and 60s along the Dandenong corridor was to front roads and open space along the rail corridor which you see through Clayton – Springvale – Noble Park areas where you don’t see the mess to the same extent. 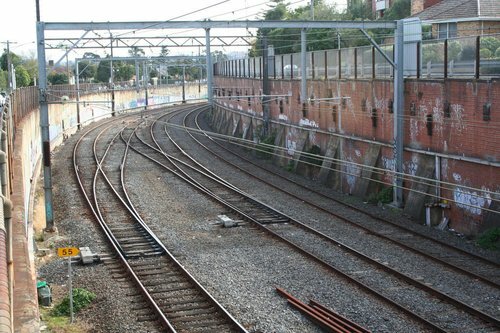 Go to Narre Warren – Berwick and Pakenham and they are once again backing properties along the rail line. Incidentally your first photo has crib walls along the rail cutting which were popular in the 1960s and 70’s – in that case above the mid 70’s additional track work to Footscray, which are one of the most resistant things to be covered in graffiti due to the lack of a ‘canvas’ for them to work on. Crib walls! didn’t realise there was a name for them, but that photo does indicate their resistance to graffiti. Maybe it’s time we brought them back, possibly painted a darker colour in a green or something, and then have vines growing in them. Even those concrete blocks that were the fashion a bit later would be OK, if they were placed at odd angles and with a rough surface. Again, plant some vines in the cracks (something which won’t grow huge roots and dislodge anything), and you’re good to go. Another graffiti-resistant solution is here (probably expensive, but very pretty). This is the viaduct taking the tracks from Central Station to the Sydney underground system. More greenery at Waverely Gardens shopping Centre (1977) facing Police Road – my old stomping ground! VicRoads regional director metro southeast Peter Todd said the roads authority’s policy was to remove graffiti that was considered racist, offensive or that had implications for road safety as soon as possible. “If graffiti does not meet these criteria, removal is prioritised according to its size and location and the amount of funding available,” Mr Todd said. So we’re now letting the existence of Taggers define what will or won’t be done? Seems a little odd to me! If you’ve read this far, you have a much greater interest in trains and trenches than most people. You probably already know the pitfalls of using Train Trenches for level crossing removals. You know they are massively disruptive to dig. You know they gobble up valuable land. You know they never get built over. You know they divide communities forever. Train Trenches are a one-trick-pony. They are a waste of a once-in-lifetime urban improvement opportunity. But others might not know. Friends, family, colleagues, followers – they’ve probably never even thought about ugly, divisive, noisy, concrete Train Trenches. This is where you can help. Tell your friends about the #NoTrainTrenches campaign on Twitter. And encourage them to sign the petition. You know Melbourne deserves better. Spread the word, and together we can get everyone talking about ambitious urban renewal alternatives to Train Trenches. It is not a matter of sky rail being better then rail under road. It is treating all those who live near to railway lines the same. For example if you had a house in Bentleigh you won’t have 25 metre high concrete stacks. While those with houses in Carnegie will have. Why should those people living along the Dandenong line have a cheap job, but those on the Frankston line have a good job? Which pre-supposes that having a long, deep trench separating you from your theoretical neighbours, shops, etc on the other side is a “good” job. 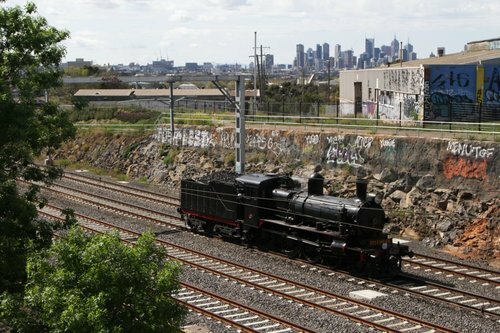 For many years, I have been concerned about the graffiti and rubbish along Melbourne’s railway lines. Some of it (e.g. Camberwell) has been there for more than 60 years. I have travelled on heavy and light rail systems around the world and Melbourne is certainly among the grubbiest by international standards. Even the Blue Line in Los Angeles which passes through some of the world’s toughest neighbourhoods is clean. Retention of the graffiti and rubbish is enshrined in the contracts between the government and transport operators. It can not and will not be removed. Ever. There is no one in the world who could or would change that. Additionally, parliamentarians (e.g. those representing the Camberwell area) have told me Melbourne people love their graffiti and general air of grubbiness. Changing that is of no priority of interest to local parliamentarians.